In a tribute to the classic Apple II game "Where in the World is Carmen Sandiego", we bring you "Holmes". Holmes is an exciting puzzle game that lets you chase a villain across the globe. You will need your wit to decode the clues left behind, describing your opponent and his next hideout. The game will guide you through over 30 cities worldwide, with hundreds of clues describing the local geography, habits, sights, languages, people, etc. Playing this game will test your global knowledge and most certainly enhance it. Each city you visit, comes with style full photographs, a detailed description and sometimes with custom composed music. (more and more cities will be added over time). In each city, one or more informants will be available to pass you valuable information. If you can decipher their clues well, you are on your way to the next city, until you caught up with your opponent. If you do, you must have a obtained a proper warrant by having discovered the features of your villain. This way you can make a valid arrest and make the (virtual) world a little safer. 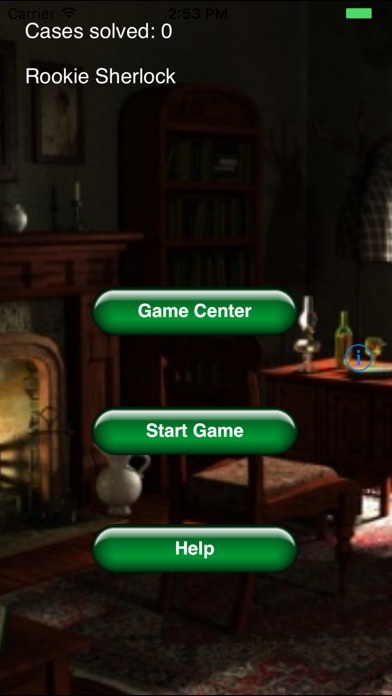 Holmes is fully integrated with Apple Game Center. So your scores are stored online and you can match your achievements with those of your friends. We hope you have a great time, learn a lot of new things about the wonderful countries across the world, but most of, we hope you enjoy playing Holmes. It is very similar to the old game, 'where in the world is Carmen', however the clues and language are terrible! I got the updates but I have one problem. The game still quits while I play it. Worst $.99 I ever spent. The game is on the order of "Where in the World is Carmen Sandiego?" Most of the clues are not that good. There isn't enough time to input the clues you do get for a warrant. If you go to the warrant menu and don't add any info your time still runs. Everyone on the leader board has only one case solved. I played the game enough to have at least 5 or 6 cases solved. I have none. The game concept is good, but overall game play needs to be improved!